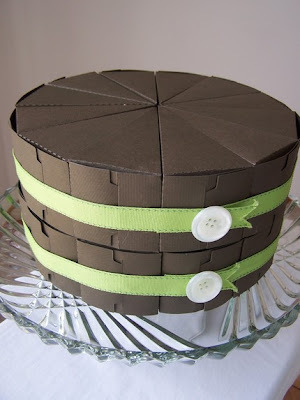 I discovered these paper cakes through a blog (I've forgotten which one) and think they are a marvelous idea: Each "slice" is a little box that you can fill with a party favour. This way, you have a beautiful decoration throughout your party, and then your guests can all take a slice home with them. Head on over to daisysanddots, and pick out your favourite flavour! Mine's chocolate (with green icing)! That's AWESOME! What a great find. Thanks for sharing!